Spring is traditionally a time of new life and rejuvenation. Our ‘Spring To Life’ Yoga and Meditation Retreat on the beautiful Balearic island of Ibiza has been designed with this in mind. A carefully curated combination of twice-daily yoga practice, meditation and delicious nourishing vegetarian food set in an incredible luxury villa location with views of the Mediterranean, this retreat offers a real opportunity to reset, recharge and realign your mind, body and spirit for the year ahead. In springtime, Ibiza is lush and green overflowing with wildflowers and natural beauty. Drink in the clean fresh air and experience the wild untamed spaces and sense of peaceful tranquility that the island has to offer. 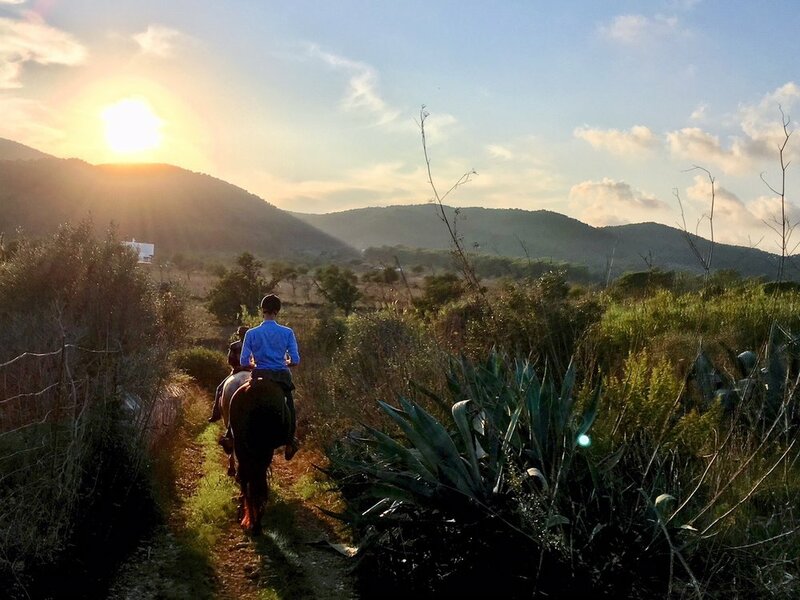 Although these can be found all year round, Ibiza is especially wonderful in these off-season months, with an abundance of hidden treasures, local favourite spots and activities to discover. Going on retreat is an opportunity to separate yourself from daily life and its demands, to meet and connect with new people, to get physically fit and strong as well as to have time with yourself, to breathe, to stretch, to be in your body and fully and experience the ever present stillness which is within us all. Sharing the teachings of yoga and mindfulness is my greatest joys and devoted passion. I feel blessed to have had experienced many incredible teachers offering their wisdom and guidance over my 20 years of practice. My yoga and meditation journey began properly in India in 1993 where I went to visit after completing my arts degree. It was an unexpected and transformational time, discovering ashram life and meeting my guru on the banks of the river Ganges in Varanasi. I dived deep into spiritual India where I studied on a one to one basis with my teacher and lived there for two years. Since 1998, I trained as a yoga teacher exploring many different traditions of yoga including Sivananda, Ashtanga Vinyasa, Iyengar, Vinyasa Flow and Restorative. After completing a challenging 10 day silent ‘Vipassana’ meditation retreat - navigating the quiet inner space and concentrating the mind - I was hooked to explore more profound breathing exercises through meditation to stay well in both body and mind. I describe yoga and mindfulness as a way of life and living aware in the present moment. My teaching brings meditative insight as I weave in mindfulness principles for reflection and self-exploration through the asana practice. We have been lucky enough to secure an amazing villa for your stay at an incredibly reasonable price. This level of luxury normally demands a much higher fee in Ibiza and we are privileged to have access to it. You will be staying in a stunning 6-bedroom architect-designed house near the southern tip of the island. Located in natural pine forests, the villa is private and secluded with incredible 180º views from its terraces, huge open-plan glass-fronted living areas and 16 metre infinity pool. Shimmering salt flats reflect the ever-changing light while the green pine-covered hills drop away into the azure Mediterranean with Ibiza’s sister island Formentera in the background. Each bedroom has its own en-suite bathroom and access to a terrace or courtyard. Throughout the villa, there are many indoor and outdoor spaces to relax and recharge either in company or alone. The villa is in a very convenient location, just five minutes drive from the airport, 10 minutes from a number of the island’s most spectacular beaches, 10 minutes to the island capital Ibiza Town and 10 minutes to the picturesque village of Sant Josep. Depending on the weather, our yoga and meditation sessions will take place either outdoors on the ground floor and first floor terraces or inside the house, where floor to ceiling sliding glass doors mean we can still benefit from stunning views and fresh air come rain or shine. Renowned for its natural beauty, beautiful beaches, historical towns and villages, top-class restaurants and unrivalled nightlife, Ibiza is always popular amongst visitors. But in the winter months from October to April, visitors can experience a different very special Ibiza. With none of the hustle and bustle of summer tourism, you’ll have the island to yourself and appreciate it as us lucky islanders do. Away from the summer heat, it’s the perfect time to get out and explore the island - on foot, on bicycle, by boat, on horseback or in a car. Your free afternoons give an opportunity for adventure. 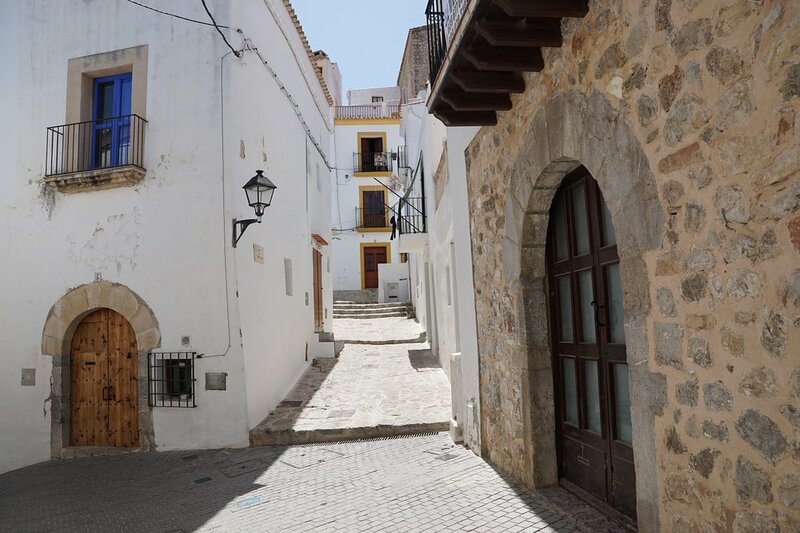 Stroll on deserted white beaches, stop off for a delicious menu del día at a local restaurant, step back in time in the cobbled streets of UNESCO World Heritage site Dalt Vila, linger in traditional whitewashed villages or for the sporty there are many activities to try. With many years living on the island, we can give insider advice on special places to visit and help you to plan and organise your trip. As part of the retreat we will each day be providing a substantial post-yoga brunch and a nourishing relaxed evening meal. The food will be home-cooked, vegetarian and nutritious with an emphasis on fresh, local and as far as possible organic produce. Outside of these meals, guests are welcome to prepare their own snacks and drinks in the villa kitchen. Please advise in an advance of any special dietary requirements or preferences. There will be two yoga sessions a day, including yoga, pranayama, mindfulness and meditation. The mornings will begin with meditation and pranayama for those early risers, followed by a dynamic yet meditative hatha flow yoga practice. After the morning session, a large brunch is served. There will be one totally free afternoon and free morning during the week giving you the opportunity to explore further afield, take a boat trip, or have a late night out and a lie in the next day. A range of treatments from our recommended therapists or a therapist of your choice. Choose from different styles of massage, reflexology, deep healing, reiki among others. There are a large number of quality holistic health practitioners on the island. If you are interested in any particular type of treatment, please let us know and we can find somebody for you. In March, there is one direct flight route operating from the UK to Ibiza. These flights leave from London City airport and are operated by British Airways/Iberia. On Sunday 24th March when the retreat starts, the BA flight leaves LCY at 13.40. On the final day of the retreat there is one direct BA flight leaving Ibiza at 10.45. It is also possible and fairly easy to fly via Barcelona. Palma or Madrid. A good place to find the best flights is www.skyscanner.net. Free airport to villa transfers are included in the retreat price. The villa is not in walking distance of any local shops or attractions. If you wish to arrange car hire, there is ample parking at the villa. We can also help to arrange taxis or private drivers during your stay.